Canadian Champion Hexen House Iserah - "Serah"
erah is Canadian Champion Hexen House Iserah. She was imported from Sweden as a puppy from Leif & Asa Granlund, Hexen House. She's quite the international girl spending the first two years of her life here at BasqueLaine in the U.S., and the past few years with her co-owner, Natalie Vivian of Blackcomb Belgians in BC Canada. We owe a huge debt of gratitude to Natalie for allowing us to have Iserah for a second BasqueLaine litter, the Super Sleuths. Serah has an incredible pedigree that brings together some of the top producing combinations in Europe. She is a Grimm van de Hoge Laer grandaughter on her sire's side and a s.r. Horry de la Clairiere aux Louves and s.r. Kleo van de Hoge Laer grandaughter on her dam's side. Serah has a friendly, outgoing disposition. She is very affectionate, sweet and loving and totally loyal and devoted to her people. Serah made her show debut in May of 2002 at the ABTC National Specialty where she won the Novice Class under breeder-judge Sharon Redmer. In very limited showing since then (working around her two litters whelped) Natalie finished Serah's Canadian championship in September 2005. Congratulations Natalie and Iserah! Serah is a medium-sized female of nice bone and substance. She has lovely van de Hoge Laer type and beautiful red color. Serah has a scissors bite with full dentition. She is balanced with good angulation front and rear and she has lovely length of neck with proud carriage. 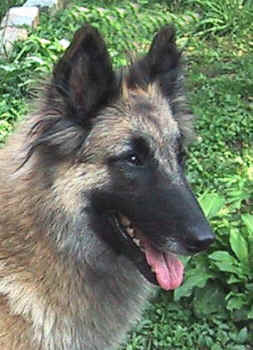 Serah is the dam of our U Tervuren litter including Roni, Kieran, Lacoda, Ben, P.J..and Usi. She is also the dam of Blackcomb and BasqueLaine's Enchanted Litter including our little enchantress Serenah, and littermates Fawkes, Tigger, Nakiska, Terah, Kiera, Biscuit, and Willow. We are extremely pleased with the puppies out of Serah's first two litters. Watch for them in conformation, agility, obedience, and herding. Serah's most recent litter born April 2007 is the Super Sleuths working/performance/show litter. 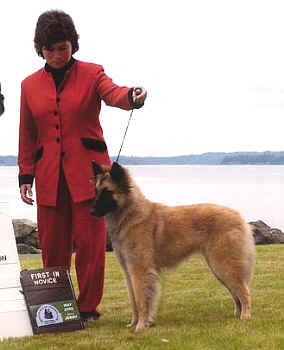 Sire is Kim Gilmore's SAR dog extradordinaire Brenner. Brenner is more formally known as Group Winning Group Placing Canadian Champion U-WPCH Gaelera Big Mtn Brennerain Can. TD, HIC, CGC, SAR Certified**. Brenner is also AKC major pointed, UKC pointed, and was WD/Select at the 2004 ABTC National Specialty. He is truly beauty and brains in one package, and he has the credentials to prove it! Feel free to email me for more details or see our Puppies Page. Click here to visit Serah's Page at Blackcomb.